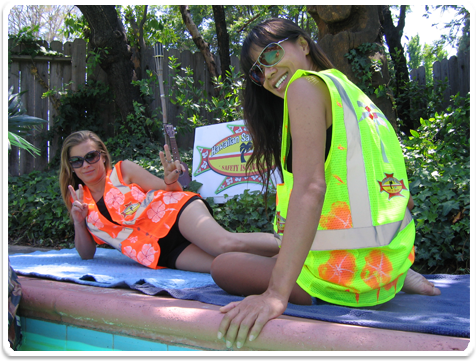 Sylmar, CA has all your tropical-themed safety vest needs covered with Hawaiian Safety Shirt. Sorry for the inconvenience. Mahalo. Ok, we'll make this short and sweet, since we know you're busy. Heck, we're busy. Huff's boat needs a good waxing. 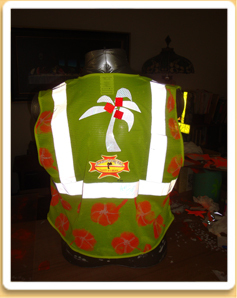 Below you'll find the coolest safety vest in the world that's perfect for not only the job site, but also the next Jimmy Buffett concert. You've heard of Casual Friday? Start a new trend with Hawaiian Safety Shirt Friday. 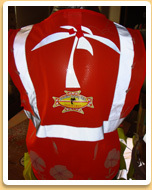 The Vest- Is an ANSI Class 2 (popular with ambassadors and visiting dignitaries) has no sleeves, and is “island breeze friendly” polyester mesh, with a zipper and a breast pocket and an inner pocket to stash those messages that you found in a bottle. Your color choice, without paying tribute to the materials acquisition gods, is all of 2- yellow (aka lime) with orange flowers or orange with white flowers. Zat’s it for now until I can find some young women folk to join the team, kick those elves out and make things a little cheerier around here. If you don’t see what you need try clicking here and see what happens. Wishes can come true. PEOPLE LIKE YOU, FROM ALL OVER, ARE STARTING TO MAKE THESE COLLECTIBLES! (approximation via inches chest diameter- most sizes are “regular” in length, yet increase, usually, in length, as they increase in overall size (we’ll get that gut covered, yet). If you need to convert to metric I am hoping math is one of your strong suits. We just use “muumuu” philosophy and get something big enough to cover most all. Also note that every piece is handmade so there are no real good reasons for returns as it may upset some demigods. That being said, we can discuss forms of appeasement as the situations avail themselves (you got bigger than you thought, etc...). Note: These sizes consider being worn over a work or T shirt or very light jacket, and production variations. Sales tax added for California customers (sorry, gubmint found me). International shipping may be more depending on location and frequency of boats from mainland. Copyright © Hawaiian Safety Shirt, 2018. All rights reserved.Designed by MarketJuice.com by Deluxe!